All About Soil - SUPERIOR LANDSCAPE PROD. You may not think much about the soil around your house until the kids or pets track it all over the carpet, but soil is one of the most important factors in determining the success of a landscape planting. With that in mind, we're going to spend some time learning about dirt. Understanding the physical, chemical, and biological aspects of the soil on your property will let you - and us - make sure your plants thrive for many years to come. Trust me, it's more interesting than it seems. You might even discover that you think soil is fun, crazy as that sounds. This week we'll cover some basics and talk about a few of the key ways your soil and plants interact. First off, what is soil? Soil is the product of thousands of years of weathered bedrock combined with a little decomposed plant and animal material near the surface. Space between these particles is another vital element of a soil. This mixture provides a place for plants to take root and for a wide variety of animals and microbes to thrive. 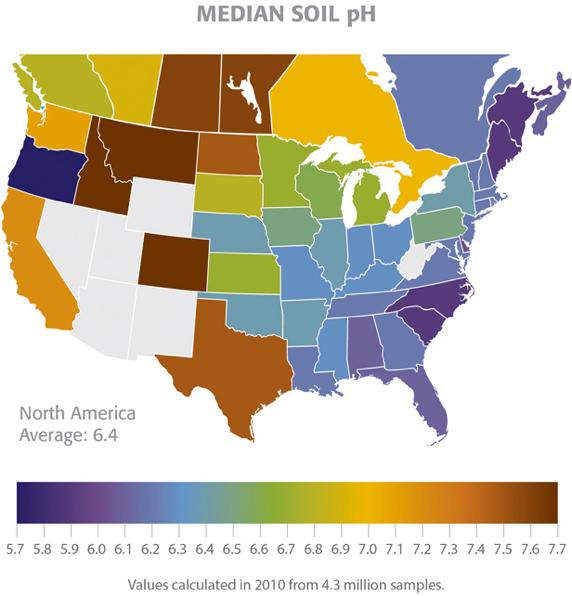 A soil's characteristics will vary widely based on the type of parent material in the region (here in Indiana we mostly have limestone), the type of plants present through the history of the site, climate, topography, the amount of time it has had to develop, and human activity. While each plant has its own soil preferences, most plants need conditions that fall under a model we call the ideal soil. 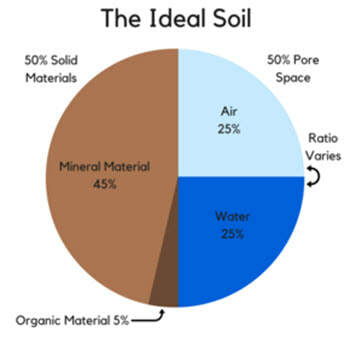 The ideal soil is 50% solid material and 50% space. The solid material should be about 45% minerals and 5% organic material like compost or manure (whenever I mention organic material in this series, I just mean it came from living material - it may or may not have chemicals). We refer to the ideal empty spaces as being 25% air and 25% water, but in reality those numbers fluctuate all the time depending on rain or irrigation, and a plant's tolerance for those changes varies. That's a good start on soil basics for this week. Keep an eye out for the next installment which will cover physical qualities of soil. If you want to learn more about what we discussed here, check out the links below. When a soil is left to develop largely undisturbed, you can end up with some beautiful cross-sections of land, like what you see in the picture on the far left. However, most undisturbed soil profiles in central Indiana are usually a little less exciting - more like the photo on the right. 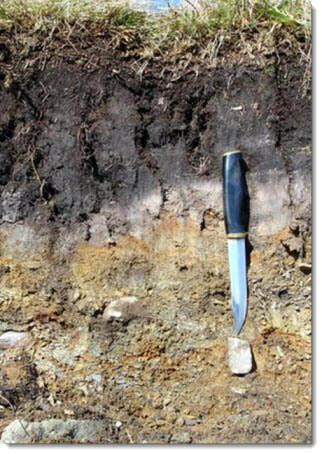 Urban and suburban soils often lack this kind of distinct layering, but we'll spend more time discussing urban soils in a later lesson. 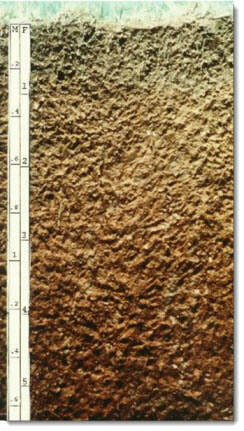 The colored layers can give you information about the composition of the soil. A dark layer is high in decayed plant matter, or organic material. Reddish brown colors usually mean good drainage here in the Midwest. A gray or mottled gray and brown layer may have poor drainage (unless it's bedrock), and if the drainage is bad enough it may even have a rotten smell. ​Soil serves many functions for plants. It allows the roots to anchor the plant in place, holds water and air for the roots to absorb, provides the essential nutrients needed to grow and develop, and houses an impressive range of macro and micro-organisms that help the plant by expanding root surface area, making nutrients available, aerating the soil, and defending the plants from harmful organisms. Soil can also pose threats to a plant. Soil that is too dense or poorly drained can suffocate a plant (roots need to breathe too!). 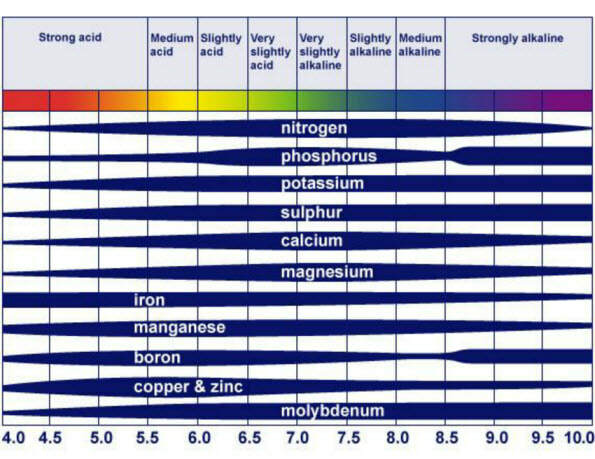 If the soil acidity is wrong for the plant, it may not be able to absorb the nutrients it needs. While there are many beneficial organisms in the soil, there are also animals, insects, and diseases that can live in the soil and attack the plant below ground where the damage is harder to see. Making sure the plants you want match the soil you have is the best way to avoid these issues.